Google Chrome has been the most popular web browser for people to surf the internet since people can sync bookmarks anywhere on any computer with his or her account signed in. 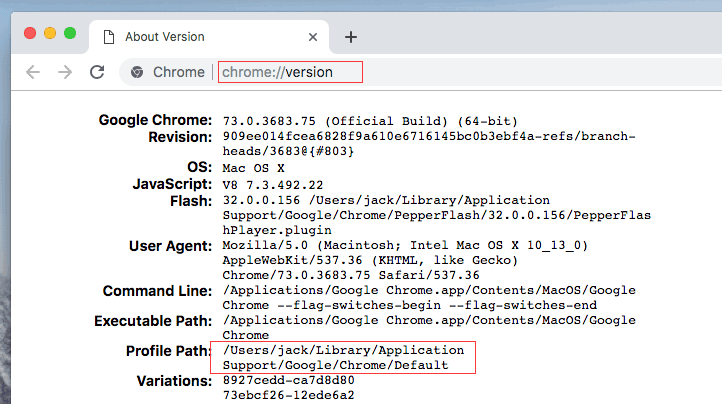 That’s why many people install Chrome on Mac as well. And I like to use Chrome mostly because there are many extensions as well as it is easy to manage Chrome Bookmarks. However, it might bother people a lot when they can’t find the Google Chrome bookmarks location on Mac or do not know how to restore and recover deleted bookmarks Chrome on Mac. Let’s solve the problem together. Where Is Google Chrome Bookmarks Location on Mac? By default, Google Chrome Bookmarks is save in : Macintosh HD -> user -> Library -> AppSupport -> Google -> Chrome -> Default -> Bookmarks and Bookmarks.bak. 1. Launch Google Chrome and enter the address in the address bar: chrome://version/ and click return button on the keyboard. 2. Next, please find the Profile Path entry. Now you can use the entry to find all Chrome Bookmarks on Mac there. How to Recover/Restore Google Chrome Bookmarks on Your Mac? 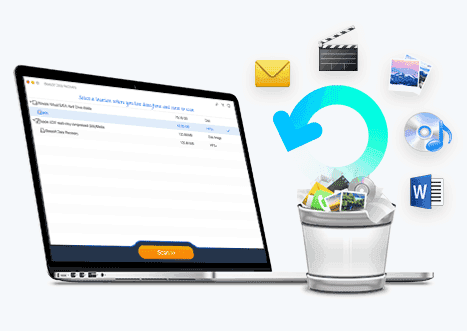 Recover Chrome bookmarks on Mac due to accidentally deleting, formatting drive, emptying trash, reinstallation macOS etc. It supports recover any file types, including Google Chrome bookmarks and history, videos, images, documents, archives, music files and more. The simple and wizard interface makes you easy to recover deleted/lost bookmarks Chrome on Mac within 3 steps. Click the Download button to get the Chrome Bookmark recovery Mac tool. Since it is not available in App Store yet, please set up your preferences for install apps from trust source first. Next, install it on your Mac. It is virus-free. In the next window, all supported files, more than 1000 types, are listed there. Here, you need to uncheck other types of files, only keep the "Other files" checked, which means it will only scan for the needed files, saving your time for the scanning process. 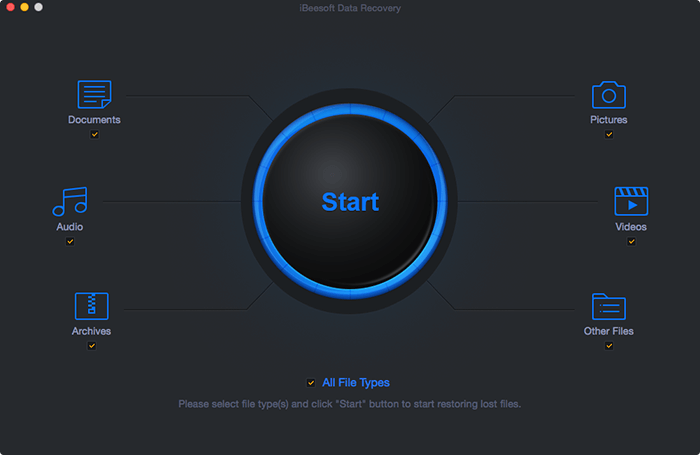 Click "Start" to the let the best Mac data recovery software begin to work. Next, you can see all hard drives on your Mac are displayed there, even including the deleted volume. From there, check the hard drive where you’ve deleted the Google Chrome bookmarks and click "Scan" to recover deleted bookmarks on Chrome Mac. In a few minutes, the software will finish the scanning process, with all the data it found a list on the left side. 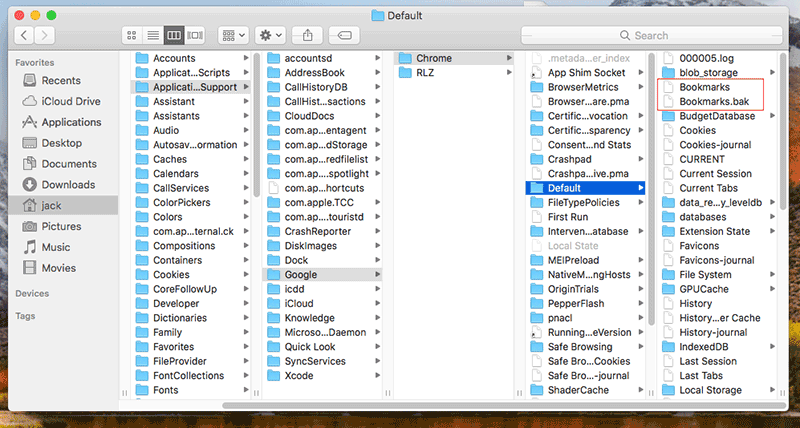 From there, you can find Chrome bookmarks on Mac hard drive. 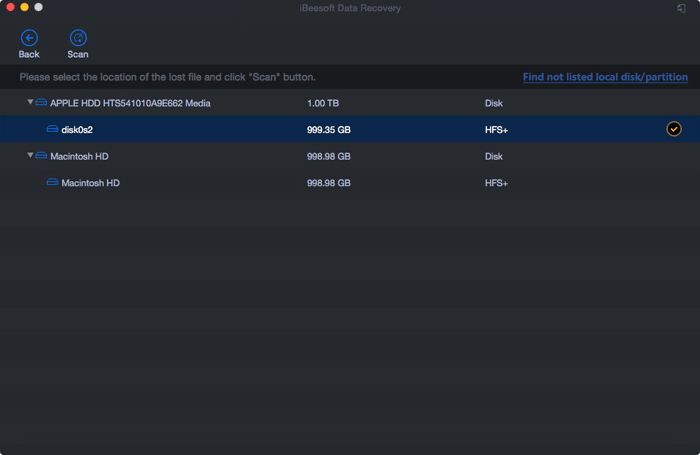 When finding the target ones, check them and click "Recover" to save them on your Mac. Once you've finished recovering your deleted Chrome bookmarks on Mac, please copy this file to Google Chrome bookmarks location. At this time, please restart chrome and you will see your lost bookmarks coming back. By default, the scanning mode you’ve used to look for deleted Google Chrome bookmarks is Quick Scan. If you’re not satisfied with the result, you can try the Deep Scan as well. It takes longer but with the better Chrome bookmark recovery result. If you have your Time Machine opened all the time for saving your files on your Mac, then it will back up all files once existed on your Mac. In this case, you can restore the deleted Google Chrome bookmarks with Time Machine. Here is the simple step for how to recover bookmarks in Chrome on Mac. Step 1. Click to Open up >Finder> and go to Macintosh HD -> Users -> user name (your user name) -> Library -> Application Support -> Google -> Chrome -> Default; in the Default folder, you will see two files (Bookmarks & Bookmarks.bak). Step 2. 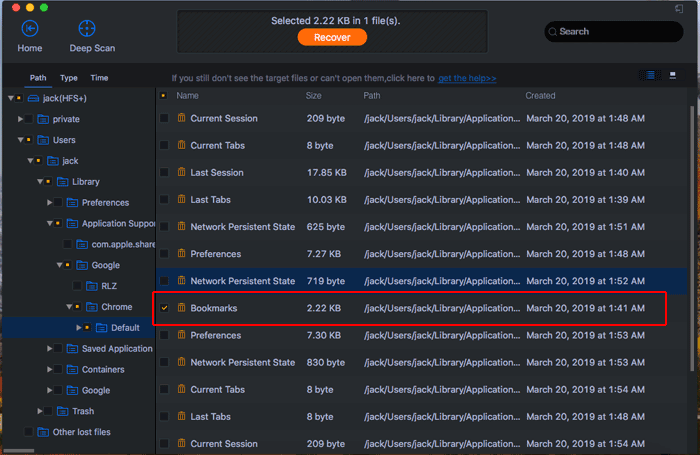 Next, copy, rename and save Bookmarks file to another location. Then, go back and delete the original file. Why do you need to do it? It means you will use the backup to create a new file. Step 3. Go down to Bookmarks.bak and rename it to simply "Bookmarks", deleting the .bak extension. It will make your backup copy of the bookmarks as the original bookmarks folder. After then you can launch Chrome again to check out the bookmarks. My Suggestion: Since we can signed in Chrome to sync Bookmarks, my suggestion is sync your Google Chrome bookmarks with your account and do not deleted bookmarks directly. You can create a trash folder to save these you not needed.